In every meta-analysis you start with the published summary data for each study and compute the treatment effect (or effect size). For example, if a study reports the number of events in each group you might want to compute the odds ratio. Or, if a study reports means and standard deviations you might want to compute the standardized mean difference. 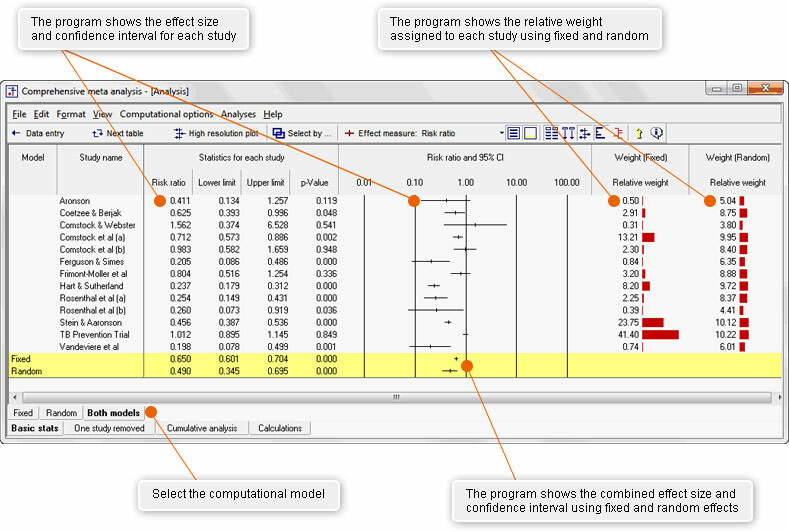 With CMA, you enter the summary data and program computes the effect size automatically. Start with almost any kind of data and CMA will compute the effect size for you. Enter events and sample size (as above) or means and standard deviations, or p-values, or odds ratios and confidence limits – select from more than a hundred data formats. What if one study provided events and sample size, but another provided the odds ratio and confidence interval and another provided only a p-value? You can enter a different kind of data for each study. 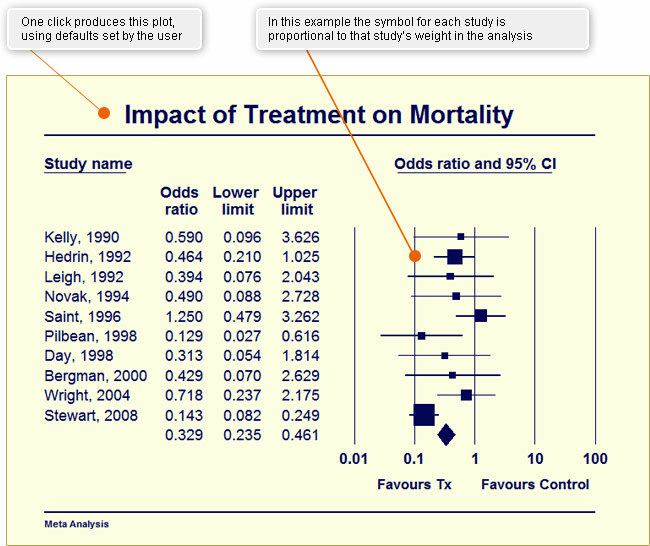 Run the meta-analysis with one click to display the screen shown here. Then use the menus to customize the display and computational options. “Is the intervention more effective for one group of studies than another?” Group by study type (e.g., chronic vs. acute patients). The program will run the meta-analysis within groups and compare the treatment effect across groups. “Does the treatment effect increase with dosage?” Use meta-regression to assess the impact of any continuous moderators. Use forest plots to communicate results clearly and effectively. 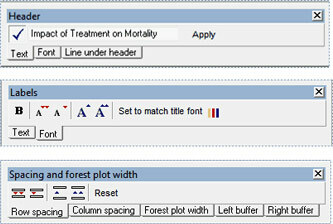 Modify the symbols, colors, text, columns. All elements of the plot are under your control. Export to Word™ or PowerPoint™ with one click !